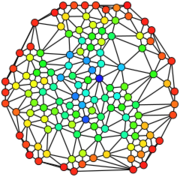 This page is a bliki - it provides a chronological history of the EdFutures community, with the most recent entries at the top. Feel free to add to it - if you want to ask questions or engage in discussion then use the Discussion tab. The NP3 meta-analysis report and a stand alone Executive summary have been published and are free to download from the NP3 website. The report raises questions about assumptions about children's access to and use of ICT outside school, it suggests a gulf exists between children's digital practices outside school and pedagogic practice inside primary school (which is at least in part due to the curriculum, assessment and accountability regimes in schools), and it illustrates ways in which ICT is being used in primary schools. Three frameworks are introduced: the Digital Practice Framework for analysing ICT use outside school, the ICT Innovation Framework for analysing ICT use inside schools, and the Innovative Pedagogy Framework for analysing practice inside schools. The public report for Case Study 4 is now available to download as a pdf. This report focusses on a range of children's use of ICT outside school, as well as use of ICT inside a Year 2 and a Year 6 class in this community school in North East of England. Download the report or look at the other NP3 public reports. The public report for Exploratory Study 5 is now available to download as a pdf. 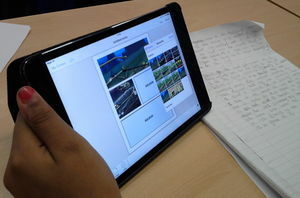 This report focusses on a range of children's use of ICT outside school, as well as use of ICT inside two Year 6 classes in this Junior school in Central England. The public report for Case Study 5, which is an extension of Exploratory Study 8, is now available to download as a pdf. This report focusses on six ten and eleven year olds' use of ICT outside school, as well as use of ICT inside a Year 6 and an Early Years class in this community foundation school in Northern England. The Open University is offering two sets of fully funded PhD opportunities in education and educational technology. If you are considering submitting an application focussed on education futures (particularly relating to school age learners) then Prof Peter Twining would be happy to discuss your draft proposal with you prior to submission. Computers & Education (the leading journal in its field) has just published 'Some Guidance on Conducting and Reporting Qualitative Studies'. This article is currently available for free download (until the 18th Feb 2017) from https://authors.elsevier.com/a/1UIfh1Hucd6WHj. Twining, Heller, Nussbaum and Tsai (2017) Some guidance on conducting and reporting qualitative studies. Computers & Education, Vol. 106, March 2017, pp.A1-A9. Naima Browne has been appointed as the full time research fellow for NP3. She will be starting at the beginning of January and running through until the end of July 2017. Naima is an experienced academic with particular expertise in the area of early years. 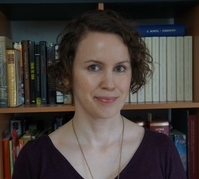 Her prior research has been underpinned by a relativistic epistemology with a strong emphasis on 'participant voice' and co-construction of meaning. Naima will be playing a lead role in the analysis of the data that we have collected over the last 18 months and in the sharing of our findings as they emerge. Cliff Top Literacies: Digital technologies supporting composing literacies in an English primary (elementary) school by Julia Gillen has been accepted for inclusion in the AERA annual conference in San Antonio, Texas next April. 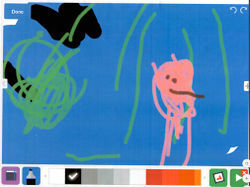 The paper, which is based on data from one of the NP3 study schools, provides 'multimodal vignettes' of digital composition practices in the school, involving children spanning the five to eleven age range. The paper hints at the diversity in children's out of school practices which often blur the boundaries between the digital and physical worlds. It argues that the vignettes illustrate how the school mitigates the mandatory 'literacy' curriculum (with its focus on standardised assessment of spelling, punctuation and grammar) in order to prioritise the needs, values and interests of the pupils. Are you interested in exploring children’s digital practices outside school and the extent to which these are recognised, valued and influence practice inside primary schools? Do you have qualitative research expertise in education or an allied field? Are you a dynamic, reliable, efficient, and fun person to work with? Can you work independently as well as being great at managing collaborative projects? Is your academic writing convincing, accessible and engaging? Are you a whizz with ICT (or at least quick to master new software)? Are you available to work from Jan to July 2017? If you answered yes to all those questions then we want you on our team. Peter Twining gave a keynote at the Naace London Conference entitled 'Children's digital practices, pedagogy & assessment - revolution, stasis & constraints' in which he started to outline some of the tentative, emerging findings from NP3. 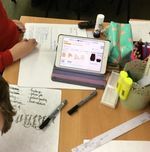 The NP3 project is entering its final phase of data collection - in which we will be working with 8 primary schools in the UK that have been identified as using ICT effectively to enhance learning across the curriculum. 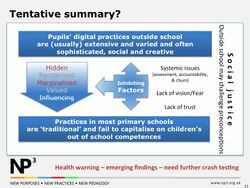 the factors that impact on the extent to which practices in schools are influenced by pupils' digital practices outside school. If you know of schools that would make good case studies then please let us know by emailing Peter.Twining at the Open University (open.ac.uk). Prof Teresa Cremin and Prof Peter Twining argue that there is often a mismatch between the IT skills school children develop in their homes and their opportunities to develop them further at school. PeterT presented a keynote at IT16 on the 23rd June, looking at ICT strategies in schools and emerging data from NP3. The full set of slides for PeterT's talk (and that of other speakers) will be available from the conference website. Tim Rylands was the other keynote speaker, and as is his normal practice he has provided a web-page with lots of info to support ICT use in schools. 2-Jun-2016 - NP3 Exploratory Study Public Reports now available to download! The NP3 team are now publishing the public reports for each of the 10 Exploratory Study Schools. These are brief, anonymised reports which discuss the children's digital practices outside of school and the extent to which these have influenced teaching and learning in school and outlines the ways in which digital technology is used across the curriculum. 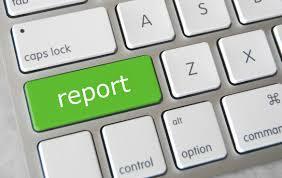 Download the reports so far. 23-May-2016 - What can we learn from The Class? An interesting article on a day in the life of teenagers which suggests teenagers actively avoid 'the digital embrace of their schools', asserting their agency as to when and how they engage online. The article is based on the findings from the research project The Class, led by Sonia Livingstone at the London School of Economics and Political Science, looking at (in part) how young people use digital technologies within their daily activities within and beyond the classroom. Fiona Henry met with Gytis Cibulskis, Head of E-Learning Technology Centre at Kaunas University of Technology (Lithuania) and Vaidotas Trinkunas, Head of Distance Studies Centre at Vilnius Gediminas Technical University to discuss the use of Swivls as a research tool to gather data in school settings, both as part of the NP3 case studies and beyond. 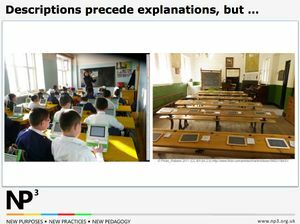 26-Apr-2016 - How can teachers be encouraged to embed pupils' ICT practices within classrooms? PeterT is on the panel at the Westminster Educational Forum in London, talking about how teachers can be encouraged to build upon the digital practices that pupils are developing outside school, in order to enhance their pedagogy. This draws upon work by the Educational Technology Action Group (ETAG), supported by additional data from NP3. A transcript of the discussions will be published on the Westminster Education Forum website shortly after the event. User:JuliaG presented a keynote paper at the third meeting of the The Digital Literacy and Multimodal Practices of Young Children group (DigilitEY), which is part of the European Cooperation in Science and Technology (COST). The event was held in Larnaca, Cyprus on 17-18 March 2016. 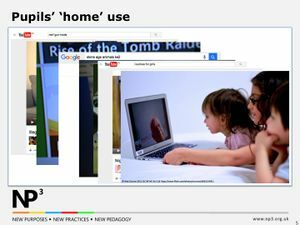 Julia's paper was called "NP3: New purposes, new practices, new pedagogy: Enhancing learning lives with digital literacies in the Early Years" and built on some early findings from the NP3 project. 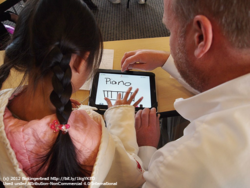 23-March-2016 - What can we learn from AltSchool? A recent article in the New Yorker magazine about AltSchool - a small chain of private schools in the US set up by Silicon Valley entrepeneurs- suggests this school is potentially interesting to the NP3 project. Digital technology is apparently embedded in the curriculum and their child-centred approach appears empowering to children as learners. Yet the school is private so it is likely to be free of many contraints that affect state schools in the US and UK. But there is still food for thought in what they do - more info here. Have a read and let us know what you think []! The NP3 team are currently analysing data from the 10 exploratory studies and writing internal reports. Some these drafts are now complete and Don Passey is doing a second analysis of each exploratory study to check the consistency of coding and interpretation. The next step will be to produce final exploratory study internal reports which will feed into our meta-analysis. We will also be producing short external reports for each of the 10 schools which will provide a useful external perspective on children's ICT practices outside school and the extent to and ways in which these are built upon by teachers. PeterT led a research seminar at Lancaster University on the 9th March in which he explored dimensions of practice as tools to enable description and thus comparison of practice across settings. This work drew on the Vital and Snapshot Studies, and emerging work on NP3. How would you describe each of these classes? What are the key pedagogical differences between them? We have now developed a coding framework to analyse the Exploratory Study Data. The NP3 team have been developing a common coding framework to analyse the NP3 data with. It has taken many hours of discussion to develop something which a)enables us to answer the research questions b)reflects our socio-cultural theoretical approach and c) reflects our data and emerging interpretations. We now have a framework to move forward with for the exploratory studies which focus on describing childrens digital technology practices and the extent to which teachers recognise, value and build on these in their pedagogy. However, many of the codes will also help us to analyse the case studies as they are also about the nature of pedagogy, children's agency as learners, teacher positioning and the flow of practices between non-formal, formal and informal domains. The picture shows one of many theoretical tools we used to devise our coding framework, which comes from Prof Peter Twinings previous work. The work of coding data is well underway. Meanwhile our consultants have been analysing data without the coding framework but we will all be using the common framework for the case studies to ensure consistency. BYOT and the Digital Evolution of Schooling is a new book by Mal Lee & Martin Levins, which looks at BYOT and how it has been implemented in a number of leading schools (what they call Pathfinders). The NP3 team are currently analysing the data we have collected for the 10 exploratory study schools. One of the challenges is how to most efficiently and effectively analyse the large amount of very rich data when we are several researchers working on different platforms. After some research and trying out different software options we have decided on MAXQDA. It is software for qualitative analysis and one of its advantages for us is that it works across different platforms (we are both apple and pc users). You can also analyse audio recordings without having to transcribe them and photos - which we have many of. Right now we are developing the coding framework and our plan is for a researcher to analyse data for each case study (in most cases, the data they collected). Don Passey will then be carrying out a secondary analysis on all the data during March 2016. Amelia H-J gave a presentation at the Cambridge Primary Review Trust London Network Meeting on ICT, pedagogy and dialogic teaching. This meeting was attended by staff from London primary schools who are interested in engaging with innovative and evidence-based teaching practices. Amelia's presentation provided an update on where the NP3 project is at and invited schools to contact her if they are interested in taking part. Her presentation complemented a presentation by the head teacher Paul Jordan from Thames View Infant School about how they are using ICT innovatively as a tool integrated into their dialogic teaching style. PeterT gave a presentation at the BETT Study Tour in London entitled "ICT in Schools: Why does it matter and what is possible?'. This built on his research on digital technology strategies in schools, including the Vital Case Studies, Australian Snapshot Studies and emerging data from the NP3 Exploratory Studies. 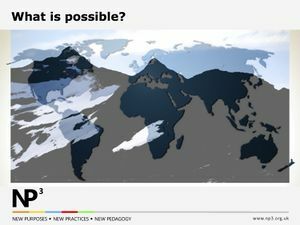 PeterT gave a presentation at the Naace networking event in Nottingham entitled 'New Purposes, New Practices, New Pedagogies' which outlined the NP3 research and encouraged Naace members to engage with the project (and EdFutures.net). The first phase of NP3 has finished, with a very disappointing response rate to Your Organisations Technology Strategy Survey (YOTS2). However, after a productive briefing day for the researchers involved we are all set to start the Exploratory Studies. We are also experiencing accelerating growth of and in the community, with more active participants and rapidly expanding number of page views (nearly 30,000 in the last week). You can check out the sites historic stats or better still join the community, contribute to the discussions re NP3 and/or add/enhance the information within the website. Progress with developing the site has been slow, but there has been some activity (particularly around the digital technology strategies work and we exceeded 1 million page views last week. Ok, I know, its been pretty quite in here for the last few months. Lots of work has been going on in the background analysing data from the 13 Australian Snapshot Studies (in collaboration with colleagues from Aus). 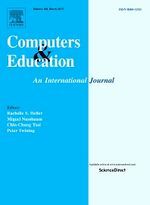 In September we are presenting five papers and a symposium at the Australian Computers in Education Conference - all based on the Vital and Snapshot Studies. Once the papers are published I'll put links to them from EdFutures publications the relevant bits of EdFutures.net. The newly formed YOTS team all met together for the first time for a day of exploration, team building, planning and cake eating – all focused on moving forward the YOTS research (and linking it in with our existing activities such as our research on digital technology strategies, music technology, collaborative knowledge building, language teaching with mobile technologies, international education, primary education,etc). Helen’s penultimate slide includes a list of useful iPad apps. We are planning to extend the YOTS team to include collaborators in Australia, the USA, China, France and Bangladesh. These are the countries that we are creating ‘localised’ versions of YOTS for at the moment. Realistically we anticipate that the Australian version will be the first to go live this year, with other versions rolling out in 2014. If you are interested in collaborating on YOTS then let me know. Whilst there have been lots of visitors to the sight (we've passed 30,000 page views), the last month has been pretty quiet in terms of contributions, reflecting the fact that the OU Vital Project is coming to an end - tomorrow is its last working day. However this means the rebirth of EdFutures.net as an independent entity. I will be taking EdFutres.net forward, extending work on digital technology strategies (including BYOT) and strengthening links with YOTS and the Schome Initiative. Talking of YOTS, our bid for funding from CREET was successful so we should now be able to push forward with creating international versions. Over the last few weeks a lot has happened. 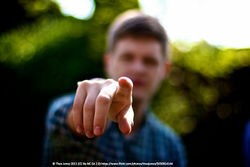 (Your Own Technology Survey)] was launched at BETT on 30-Jan and has started to take off. Indeed today there is a meeting of folk at the OU who want to join the YOTS research team. We are bidding for some internal funding to enable the development of 'international' versions of YOTS and are in discussion with a potential sponsor. Vital ends in four weeks, so its pretty busy! Come April I will be on study leave, which will enable me to finish off the meta-analysis that is leading to info on trends and guidance on digital technology related strategies in schools. I guess its worth noting that EdFutures.net has now had over 90,000 page views. Since we've tightened up the sign up process the number of new users has decreased, but we have a trickle of genuine new community members now, which is great. I'm very excited about the things that are coming up for EdFutures.net. The data collection for Vital's research looking at aspects of Digital technology strategies has been completed and we will be publishing a series of case studies, meta-analysis reports and Vital Guides over the coming months. The YOTS (Your Own Technology Survey) is due to be launched later this month. The community continues to develop slowly but surely. There were 17 active users in the last 30 days. We exceeded 50,000 page views yesterday, have 90 content pages (including a great new section on Learning Analytics) and discussions are starting to draw in new members (e.g. see the discussions about the ICT curriculum). the difficulty that teachers and other folk have in accessing research if they don't belong to an academic/university library. New communities take time to develop. In the very early days of EdFutures.net we were getting lots of bogus registrations and almost no real ones other than from new team members. Since User:Arided took on the techy admin side of the site, changed how registration works and added functionality such as the enhanced editor we have had a steady trickle of new/genuine registrations. I live in hope that these newcomers will develop into active members of the community. A free online course offered by the University of Edinburgh entitled E-learning and Digital Cultures. The course will will explore how digital cultures and learning cultures connect, and what this means for e-learning theory and practice. Follow this course at #edcmooc on Twitter. The second 'selection' workshop took place at the end of October and our team of researchers (around 20 of us) are in the process of sorting out which schools we will work with. It looks like we will have up to 26 case studies, which is more than I had hoped for and allows for some wastage. Our aim is to complete the data collection and first stage of analysis by this term. 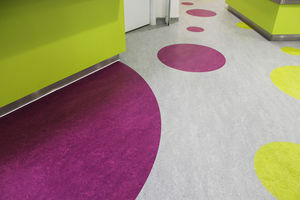 Brief case studies on individual schools will be published in January 2013 and then the meta-analysis across the case studies will be completed and reported on by March 2013. We had the first of two 'selection' workshops for potential consultants to join our team carrying out research on aspects of ICT implementation in schools to feed into a series of Vital Guides. If your school is involved in implementing 1:1 computing, BYOD, BYOT, a Digital Leaders programmes, a Responsible Use Policy (developed with pupils), or Virtual tuition/schooling and might be interested in being a case study school then contact me to find out more. The ICT Curriculum bliki is attracting a lot of attention - helping us pass the 10,000 page views mark today. I'm thinking about whether we should create some badges or barnstars to acknowledge the expertise and contributions of members of our community. Another landmark achieved today - we now have over 50 registered users! We had our first team meeting today, using Collaborate (video conferencing). Exciting meeting new people for the first time and finding out about their interests. We agreed areas of activity, which are going to be around Practitioner Research, iPads and other tablets, Game based learning, Digital Leaders, Embedded Technology, and virtual schooling/tuition. Interesting meeting with E-Act (a major Academy chain) about their innovative uses of new technologies. We are hoping to collaborate with them on researching some aspects of BYOD, moving to the cloud, etc..
We are recruiting a handful of PhD students and other interested folk to help enhance the wiki. Arided joined the community. PeterT submitted a piece to the ITTE newsletter as the first move in publicising EdFutures.net. Not expecting the newsletter to come out or a month or so, by which time Steve's initial review of published info re ICT strategies should be completed. We have started work on reviewing the existing literature. Steve Davies is doing an initial trawl between now and mid September. The EdFutures.net wiki came into existence. At the time the EdFutures.net community only had two members: PeterT and Fiona. In June 2009 PeterT was awarded a grant by the DCSF (Labour Government) to run Vital - a professional development programme to support staff in state funded 5-19 education in England to make even better use of ICT. Right from the start Vital focussed on practitioner research as a critical underpinning of all its activity. By 2011, when Vital's funding was extended for another year by the DfE (Coalition Government), it had become clear that one of the big challenges that needed to be addressed was how to share research evidence of what worked (and what didn't) between practitioners, researchers, policy makers and the commercial sector. the EdFutures Evidence Hub, which continued to be developed by KMi and other colleagues in the OU. PeterT wasn't keen on school as a child, and has spent his entire career working on aspects of enhancing education. In the early years digital technology was a core focus, as he thought that it would act as a trojan mouse (catalyst for change). Whilst working on his PhD PeterT came to the conclusion that he had got it all wrong and needed to focus on visions for education. This led to the setting up of the Schome Initiative in 2004 - for more details see the Schome community history. Running alongside the work on the Schome Initiative PeterT was the Head of Department of Education at the Open University - and developed a vision for the department with the tagline Developing 21st Century Educators. He then became the Co-Director of the Centre for Research in Education and Educational Technology (CREET) and had the task of trying to help align its work to maximise its impact. PeterT wasn't in that job for long - because he got a grant to work on Vital in June 2009. However, CREET's overarching theme subsequently became Education Futures (in 2010). This page was last modified on 11 September 2018, at 14:53. This page has been accessed 43,829 times.